You are currently browsing the tag archive for the ‘assises’ tag. On January 13th 2009, the E.C.H.R found in case Taxquet v. Belgium (926/05) [en] a violation of article 6-1 of the Convention on the ground that the ruling of the criminal court (“cour d’assises“) was not motivated. On June 5th 2009, 5 judges of the grand chamber accepted to hear the appeal of Belgium. On September 15th 2009, France submitted a brief (see below). On October 21th 2009, a public hearing was held by the Court [en]. On November 16th 2010 the grand chamber confirmed [en] the finding of the violation of article 6-1 of the Convention. On September 25th 2008, the bill 4-924 introducing the motivation of ruling of criminal court was submitted to the Senate. On December 10th 2009, the senate voted the law which took effect on January 21th 2010. Under the new law, the defendant can only be condemned if the admissible evidences shows there is no reasonable doubt that the defendant is guilty. The grounds for the guilty ruling and for the sentencing, have also to be stated and an appeal to the supreme court is created. In France, the rulings of the criminal court are still not motivated. In 2009, there was 3,345 rulings by criminal courts in France. The supreme court (Cour de cassation) ruled that the lack of ground was not a violation of article 6-1 of the Convention (cases 08-86480, 08-88112, 09-82459, 09-81.018, 09-82665, 09-85146, 09-86090, 09-84166, 09-87307, 09-88414). The French government didn’t introduce any reform of the criminal court. 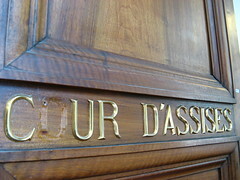 In its threatening observations to the E.C.H.R, the French government argued that the grand chamber couldn’t find a violation of article 6-1, otherwise thousands of criminal court rulings will have to be quashed (34) and that the E.C.H.R didn’t have the capacity to make such decision (33).